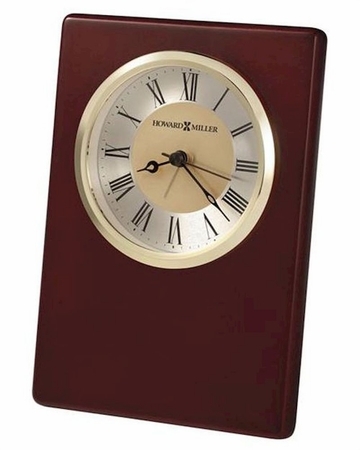 Rectangular table clock with a Satin Rosewood finish. The satin gold-tone center of the dial is surrounded by a spun silver finished outer ring with black Roman numerals and minute track. Polished gold-tone bezel and glass crystal. Black hour, minute, and seconds hands with a silver alarm hand.